The 3HP Direct Drive Compressor 100L Tank is your perfect companion for a variety of tasks around the home. 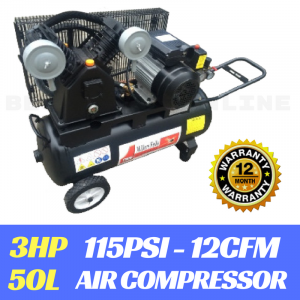 SUPERIOR: With an air output of 350 litres per minute from its 3HP direct drive motor and 100 litre tank, this compressor will easily power the likes of sandblasters, air hammers, gravity feed paint guns, nailers and blowers or operating impact wrenches, air drills as well as some of the larger tools if needed. 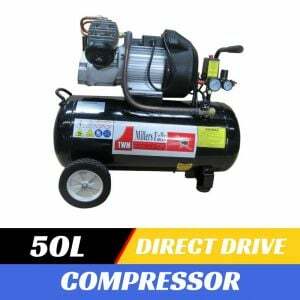 RELIABLE: Designed for a wide variety of uses, this direct drive compressor is a compact and versatile compressor that gives you great performance and has been built to last with safety in mind and genuine value for money. It comes with handle and industrial rubber wheels for easily transport to anywhere you want. It's fitted with a large rubber foot for stability and anti-vibration when using. 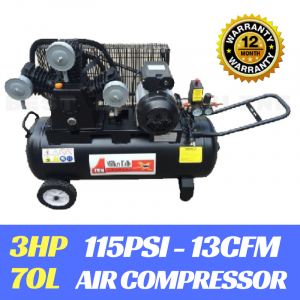 All of the features you need are included such as tank and outlet pressure gauges, a regulator for the outlet pressure, safety relief valve, and standard Nitto air fittings. 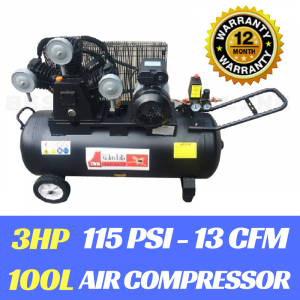 Compressor comes completely assembled apart from the wheels, filters and handle which will take you no more than 10 minutes to get it ready to use.